Because land development and construction companies are constantly faced with new environmental laws and regulations, Inland Erosion works hard to stay one step ahead of industry demands. The Inland Erosion team has been involved in Storm Water Pollution Prevention Plan (SWPPP) compliance since 1994. When SWPPP was first introduced, we developed many solutions to help companies remain compliant. This commitment continues as we see job site demands enforced more rigorously every day. Concrete washout is one important element of compliance, and we're pleased to offer a field-proven solution that is simple, safe, and economical. Cement products such as concrete, mortar, grout, and stucco are known to have high pH levels that are harmful to water systems, wildlife, and soil. Various methods have been used to address the onsite washout problem. However, building onsite washout pits (and rebuilding them every time they fill up), or paying a trash hauler to line a new lowboy with Visqueen, are expensive solutions. So IEC partnered with Minegar, a leading provider of concrete washout equipment, to deliver a proven solution based on many years of field-testing and development work. Inland Erosion exclusively uses Minegar's concrete washout box (CWB), believed to be the best on the market, which is ideal for developers and contractors looking for a cost effective and fully compliant method of dealing with onsite washout. 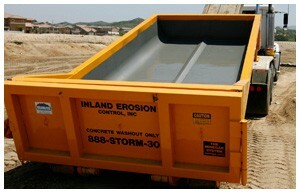 Tell us how many concrete washout boxes (CWBs) you need. We'll deliver the CWB(s) to your job site. Fill the CWB with concrete washout water. Call us when you're ready to empty and return the CWB, or remove excess water so you can keep filling the CWB. We take care of all removal and recycling issues. Please contact us when you're ready to start using this simple, safe, convenient, economical, and fully compliant solution.